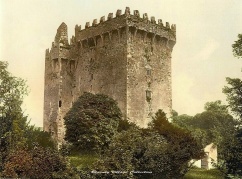 We are based in Blarney Co Cork Ireland which is located in southern Ireland near the city of Cork as well as a depot in Rhode Island in the United States.We have been involved in the Irish gifts business and Heraldic coats of arms for many years and pride ourselves on our customer service and research of family crests. We take great pride in our products and most of our customers feel our products are always of a superior quality. Blarney itself has a long history of weaving and has a worldwide reputation for quality products like woolen sweaters, coats and indeed tapestries and embroideries.Blarney Woolen mills was built in 1824 and was a huge source of employment for the people of Blarney.Due to the rich heritage of the Blarney area, it makes us proud to be the first in the world to utilize the latest in computer technology to bring you these outstanding new products. When a tapestry throw is requested we cross reference using the latest software and many old books from the 17 and 18 hundreds like "Burkes General Armory compiled by Sir Bernard Burke in 1842. The coat of arms is then meticulously digitized piece by piece using state of the art software and powerful computer programs to transform your coat of arms into a format that our computerized looms can recognize.The tapestries are hand finished and every one is a true work of art.Each tapestry throw or embroidery is individually woven on a loom utilizing over eight miles of richly colored cotton yarn. The detail we can achieve with our woven family crests or woven photographs will astound you. A tapestry throw or embroidery is 54 inches by 70 inches that is aprox 4.5 feet by almost 6 feet,huge! Our tapestries are 100% jacquard woven cotton and are not printed.Your tapestry throw will not fade even with repeated washing, so you truly will have a new family heirloom or work of art to hand down from generation to generation. We not only have Irish Coats of Arms or Irish family crests but we also have Scottish Coats of arms or Scottish family crests ,English Coats of arms or English family crests ,Welsh coats of arms or family crests, German Coat of Arms or German family crests, French Coats of Arms or French family crests,Danish coats of arms or Danish family crests,Spanish coats of arms or Spanish family crests, Dutch coats of arms or family crests, Polish coats of arms or Polish family crests,Swedish coats of arms or Swedish family crests Australian coats of arms or family crest,New Zealand coat of arms or family crest,Italian coats of arms or family crests,Belgian coats of arms or Belgian family crests, Norwegian coats of arms or Norwegian family crests ,a Finnish coats of arms or family crests,Family crests from America and American family crests as well as coats of arms for Americans as well as coats of arms for America, family crests for Canadians or family crests for Canada as well as coats of arms for Canadians and coats of arms for Canada as well as Coats of Arms and family crests from most every other European Country. Also we not only have a huge range of personalized Irish Coat of Arms gifts or Irish family crest gifts but we also have Scottish Coat of arms gifts or Scottish family crest gifts ,English Coat of arms gifts or English family crest gift ,Welsh coat of arms gifts or Welsh family crest gifts, German Coat of Arms gifts or German family crest gifts, French Coat of Arms gifts or French family crest ,gifts Danish coat of arms gifts or Danish family crest giftsSpainish coat gifts of arms or Spanish family crest gifts, Dutch coat of arms gifts or Dutch family crest gifts, Polish coat of arms gifts or Polish family crest ,giftsSwedish coat of arms gifts or Swedish family crest giftsAustralian coat of arms gifts or family crest gifts,New Zealand coat of arms gifts or New Zealand family crest gifts,Italian coat of arms gifts or Italian family crest gifts,Belgian coat of arm gifts or Belgian family crest gifts, Norwegian coat of arms gifts or Norwegian family crest gifts,a Finnish coats of arm gifts Finnish family crest giftsFamily crest gifts from America and American family crest gifts as well as coat of arms gifts for Americans as well as coats of arms gifts for America, family crest gifts for Canadians or family crest gifts for Canada as well as coat of arms gifts for Canadians and coat of arms gifts for Canada as well as Coats of Arms and family crests gifts from most every other European Country.